This is a working checklist for medical supply related items you will need to address in the weeks before your hip replacement surgery. Order Your Surgery Recovery Aids – You will need to purchase several assistive aids and have them ready before surgery. The items to purchase are listed below. A link is provided to the top selling item for each device at Amazon. This removes a lot of the guesswork as to which items, out of thousands, you should consider buying. “Here’s Johnnie!” I always thought that the only walker I would need late in life was Johnnie. I never envisioned it would be aluminum frame to allow me to get around. If you are of average health or better, I would suggest buying a walker with front wheels. Hip Tip – Buying A Walker: The first thing that strikes you when researching walkers is that there are many, many brands of walkers with wide-ranging pricing. I thought I would a full geared, full-gadgeted walker, but I am glad I didn’t. Unless you have physical limitations, you will not need the walker that converts into a seat, one with a basket, one that has a set of saddle bags for extra storage, the one with a hanging pouch, or even one that has a holder for your beer can. The tray feature is nice, but I never used it. For most people, a basic walker will meet your needs. Here are three walkers, all are 5-star rated at Amazon. One walker is a basic unit, without wheels Ez2care Comfy Lightweight Handle Classic Folding Walker, Adjustable Height , one walker is a basic unit, with wheels Ez2care Deluxe Two Botton Folding Walker with 5-Inch Wheels and third walker is a four wheel Rollator with fold up seat that has removable back support and a basket (this unit is the #1 seller for its’ kind at Amazon) Drive Medical Four Wheel Rollator with Fold Up Removable Back Support. Crutches – You will need to note that crutches, while adjustable, do come in sizes. The underarm pad should be two to three finger widths from your armpit, or you will get chafing. The hand grip is positioned so your elbow has a 30 degree bend. These are the top selling crutches at Amazon Crutcheze Black Underarm Crutch . Hip Tip – Insurance Coverage For Mobility Aids: You will generally find that your insurance coverage does not cover the purchase of any mobility aids. 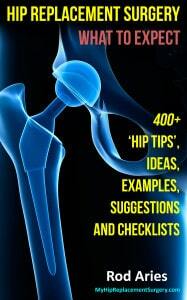 Hip Tip – Buying Walkers and Crutches: You can purchase these items online at stores like at Amazon.com or eBay.com. I used my walker for less than a week so you may not need a walker with all the bells and whistles. Check your local Goodwill or Salvation Army store as they frequently have walkers, crutches and wheelchairs available for a fraction of the cost. I bought two walkers (one with wheels) at Goodwill for $40 total; one for indoor use and the other for outdoor exercise. I also found a set of extra tall crutches for $10. Hip Tip – Walker Accessories: The walker I bought at Goodwill already had a tray and I was pleased with that. In retrospect, I really didn’t use it, nor need it. If you are of average health, you may not require a tray either. Hip Tip – “Not So Fast”: After I had recovered enough so I no longer was using my walker and crutches, my wife, in ever tidying-up mode, suggested I donate my walker and crutches back to Goodwill. I immediately said, “Not so fast. I have another hip.” Since my left hip is only slightly better than my operated on right hip, we kept the walker and crutches for an anticipated future surgery. Chariot Of The Gods – Depending on your physical condition, you may require a wheelchair. This is the top selling wheelchair at Amazon. Self Transport Folding Wheelchair with Detachable Desk Armrests, Swing-away Detachable Elevating Leg Rests, Solid Castors and Large Rolling Rear Wheels. Emperor’s New Throne: Get A Grip – We all have a favorite place to sit, but during early rehab, that place may well include a raised toilet seat Drive Medical Premium Seat Riser with Removable Arms for Standard Toilets, preferably with arms. The toilet is one area where often the seating is low and that can have an adverse reaction on your hip. Most raised seats will have a clamping mechanism that locks the seat onto the toilet bowl. You don’t want to worry about the toilet seat coming loose or shifting during use or when you stand up. Emperor’s New Throne – Version 2.0 – Some patients may benefit by having a bedside commode Bedside Commode/Toilet Seat/Safety Rails – All in One . Your therapist will assist you in determining which features are right for your needs. Hip Tip – Slow Closing Toilet Seat: After surgery you are not going to feel like lifting and then lowering the toilet seat (even though your spouse has trained you for years to get to this point). It is just a lot of stress on your hip. Here is something that solves half the problem – a slow closing toilet seat American Standard Cadet-3 Elongated Slow Close Toilet Seat. It works like this, lift normally, start to lower then let go, and it will slowly lower itself to flat position. You don’t have to bend over to lower and there is no slamming of the toilet seat against the toilet. Think About That Scene From Flashdance – You may consider purchasing a shower chair Ez2care Adjustable Lightweight Shower Bench . Make sure your shower chair has arms, can support your weight and height and offers non-skid feet. This way you can sit under the exploding shower head, and for a minute, think you really are Jennifer Beals. Bench Yourself – A bathtub transfer bench Drive Medical Plastic Transfer Bench with 3 Position Backrest is often recommended for patients with weight-bearing limitations. The bench rests on the sides of the tub and allows you to sit down. If you require additional assistance, you can purchase a bench that slides Duro-Med Heavy-Duty Sliding Transfer Bench with Cut-Out Seat . You Really Clean Up – Your inability to bend at the hip will pose a problem while taking a shower. You will need to buy long handle bath sponge 100% Deluxe Brush Natural Boar Bristle Detachable 17″ Curved Long Handle – premium quality to access those especially hard to reach areas. As discussed elsewhere, have grab bars installed for your shower/bath area. Hip Tip – Two Dollars Of Plastic Bottles Can Save You $60,000: I bought six empty plastic squeeze bottles 8 oz Amber Plastic Boston Bottle with Black Disc Lid 6 pk . I then used one bottle for shampoo and another plastic bottle for body soap and tied a rope around each then draped the rope over the shower head. This way the soap you need never falls to floor where you can’t reach it. If you reach to the floor you can dislocate your hip which sends you back to surgery. Reach Out, I’ll Be There – One of the most useful items you need is a grabber – reacher Ettore Reacher Grip ‘n Grab . This assistive aid allows you reach items without having to bend your hip, especially items from the floor. I bought a lower priced grabber at Amazon and after about four weeks of use some of the compressed connections where coming apart. The type of reacher I bought for $10 was adequate, but not great. After a month of use it became flimsy. Buy a good grabber. Easy On, Easy Off – When wearing shoes, you can benefit by purchasing a sock aid with foam grip , elastic shoelaces EZ Laces No-tie Performance Lacing System and a long handled shoe horn Long Metal Shoe Horn . The sock aid was the most practical item of all the foot accessories. It is a plastic cylinder with rope handles. You pull a sock around the cylinder, insert your foot into the cylinder and use the handles to pull your sock. You will learn where the optimal location is to anchor the sock on the cylinder. Not one size fits all, so my dainty size 14 feet were challenged at times. The elastic shoelaces expand to let your foot slide into your shoe, then allow you to easily remove your foot when done. They are handy to have. The long handled shoe horn allows you to slide your foot into a shoe without over-bending your hip. I first bought a plastic shoe horn, then ultimately bought a metal long handled shoe horn. Hip Tip – What Socks To Wear: I didn’t wear socks, or shoes, much but if you have to wear socks it will be easiest if you wear anklet socks until you heal. You can also buy socks with a bit of traction on the bottom to prevent you from sliding. These traction socks TractionSocks Non-Slip Organic Cotton Socks can help keep you from having your hip dislocated. Dress For Success – You remember all those days where you could wake up late, put on some (hopefully) clean underwear, a pair of jeans and a t-shirt and be out the door in less than a minute? Well, kiss that memory good bye. Your post surgery condition will slow that entire ‘getting dressed’ process down to a crawl. A dressing stick Dressing Stick is essential for anyone who has difficulty bending – that includes you. The stick will assist you in putting on shirts and jackets and has a small hook on the opposite end aids in pulling zippers. Hip Tip – Dressing Stick: Note that some grabber/reacher devices have a small appendage that can hook your clothes and you can then use that as your dressing stick. Most Valuable Assistive Device – The one device that provided the greatest safety measure and assistance was a leg lifter strap Leg Loop Lift Strap , also called a leg loop. The leg lifter strap was the most valuable assistive device I used. The foot of your injured hip goes in the big end, and your hand in the other – then pull up. I used this assistive device every time I got into bed and into a car. I had a lot muscle but I didn’t have the strength to lift my leg to get into an automobile or onto my bed. This leg strap made all the difference in the world because I could place my foot in the loop on one end, then use my arm strength to lift my leg. The Embarrassing Urine Bottle – OK, this section is really embarrassing – I bought this item and saved me over and over and over. With wine there are many types of wine glasses – standard, flute, tulip, couple, hock, tumbler and probably thousands more – you just never know which one to purchase. Fortunately, at least for males, there really is just one type of urine bottle Male Urinal w/Cover. Now at first this seems like a trivial accessory, but when it is 2 a.m. and you are flat in your back, barely able to move, let alone swiftly make it to the bathroom, a urine bottle is a great friend. I had a lot of swelling along my sutures and because of that fluid I was having to urinate every few hours. This inexpensive plastic bottle saved me from another kind of embarrassment quite a few times over the first week of recovery. It may not look pretty, it may be embarrassing, but it works. Put It On Ice – A reusable ice bag Mueller Ice Bag, Blue, 9 Inch is handy during the first couple of weeks to help manage swelling. Hip Tip – Order Early: Do not wait to order your post surgery aids. Online items can sometimes be back-ordered or slow to arrive. If you think that you can easily drive around and find everything you need, you will be hard-pressed to find many stores that offer everything you need. Even harder to find these items at a less-than-inflated price. Sitting Pillow: Buy a soft foam or gel pillow Orthopedic Gel Seat Cushion can make it more comfortable to sit. It will provide additional height for safer hip precautions and benefit you as you will be sitting most of the time. Hip Tip – One Year Later: I still use my gel pillow on my desk chair. Sync Your Mobile Phone And Tablet – You can set up your smart phone and tablet so you can check email from the comfort of your bed or soft couch. I bought a strap holder for my iPad. There are many types of 4 star Amazon rated iPad & Tablet Strap Holders. Hip Tip – Move Technology Closer To You: If you have a desktop (or laptop) computer, move that device where you can easily access it. Often that means in the dining area or into your bedroom. The goal is to not have to go up or down a set of stairs if you need to use your computer. Alrighty… that concludes Chapter 18.